I'm making a three-strand bracelet. I'd like to keep each strand in its own row across the bracelet's length, but then connect them all to a one-strand clasp. How do I do this? 1. Use a jumpring to attach the single loop on a one-to-three connector to your single-strand clasp. 2. Use crimp tubes to attach a strand of Accu-Flex® beading wire to each of the three loops on the other side of the connector. 3. String approximately 1-inch of beads on each wire, and add a spacer bar to keep the strands from overlapping. 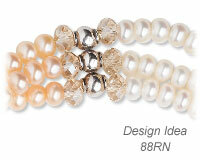 Repeat, adding beads spaced by three to four bars along the length of the bracelet. 4. Connect the three strands to a second one-to-three connector. 5. 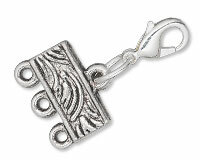 Attach the connector to the second half of the clasp.